One of the little secrets about boutique gaming-PC shops is that many of them resell the same core OEM laptops after cosmetically customizing them with paint jobs, decals, and sporty-looking panel covers. These firms emphasize the highly tailored nature of their offerings to justify stiff price tags. Digital Storm is refreshingly different—at least when it comes to price. You can pick up its 17-inch Krypton model S-8298 gaming laptop for $2251—that’s almost $1600 less than the similarly configured Origin’s EON17-S I reviewed in June. To be fair, Origin’s machine has a more powerful mobile CPU—an Intel Core i7-4940MX Extreme Edition, where the Krypton is outfitted with Intel a Core i7-4810MQ—but as you can see from our benchmark charts, the EON 17-S isn’t that much faster on most counts. Like many boutique builders, Digital Storm relies on the third-party manufacturer Clevo to provide the Krypton's (rather thick) chassis. In fact, the 2014 Alienware 17 earned a higher Laptop WorldBench 9 score than both of these machines. The $2968 Alienware is powered by an Intel Core i7-4910MQ. All three machines come with 16GB of DDR3/1600 memory, a 256GB SSD, and the same mobile GPU: Nvidia’s insanely powerful GeForce GTX 880M, which has an 8GB frame buffer of its own. 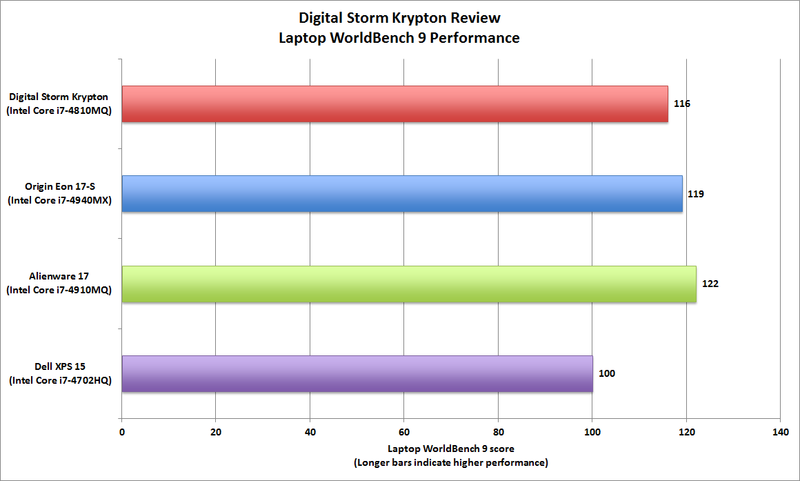 If you’re looking for a small high-performance gaming PC, don’t plan to travel a lot with it, and you’re comfortable solving your own hardware and software problems (more on Digital Storm’s tech support later), the Krypton is a no-brainer. Now let’s see just how much keister the Krypton can kick. The 2014 Alienware 17 earned a higher WorldBench score than all three of the laptops we compared it to. At its native resolution of 1920x1080, the Krypton played every game I tested flawlessly, without a smidgen of lag or pixilation. It delivered BioShock Infinite at a sweet 125 frames per second (with image quality set to medium), hanging tight with the EON 17-S and beating the Alienware by 3.8 fps. 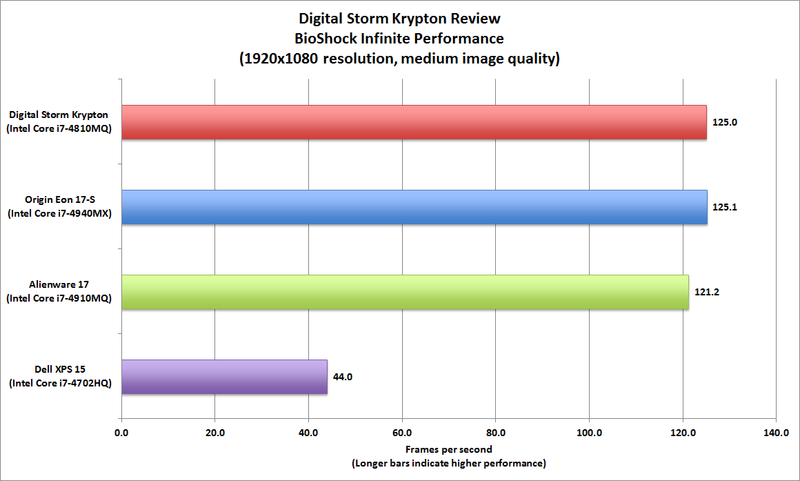 The Krypton comes with Nvidia's most-powerful mobile graphics processor makes short work of BioShock Infinite. Battlefield 4 pounds harder on both the CPU and GPU, and the Krypton fell behind the EON-17 S and the Alienware 17 on this score. The Origin’s Intel Extreme Edition processor really served that machine well on this particular benchmark. 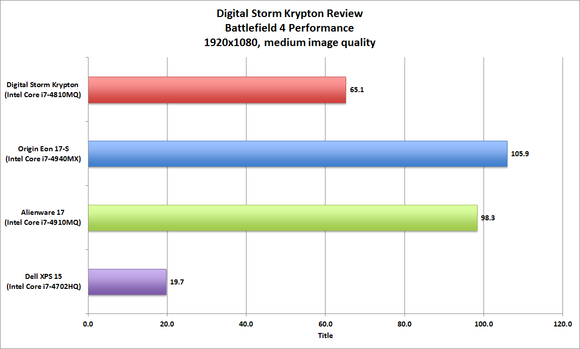 But the Krypton gets outclassed in our Battlefield 4 benchmark by the faster CPUs in the Origin and Alienware machines. The Lab didn’t benchmark the Krypton at 2650x1600, but I hooked up a Dell 30-inch flat-panel (UltraSharp 3008WFP) to its DisplayPort to check out several games at that res, including BioShock Infinite, Battlefield 4, Call of Duty: Ghosts, and Grid 2. They all looked terrific. The destructive realism in Battlefield 4 was breathtaking. Clearly, 16GB of memory is no long ridiculous excess—at least when it comes to AAA games such as Battlefield 4. Digital Storm scores a direct hit when it comes to immensely engaging game-playing—at least on the home front. I had a great time hunkered deep in my man-cave with the Krypton, a 30-inch flat-panel, and a high-end gaming mouse. 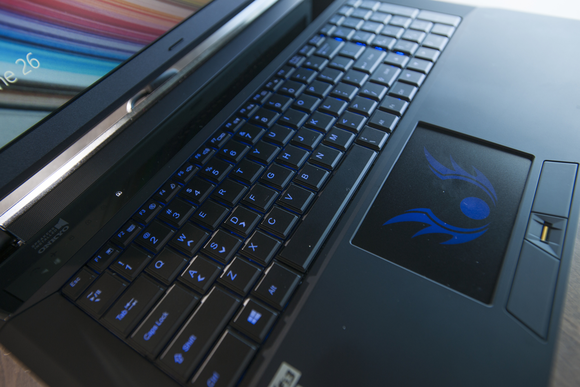 This laptop cruised through non-gaming workloads, too. 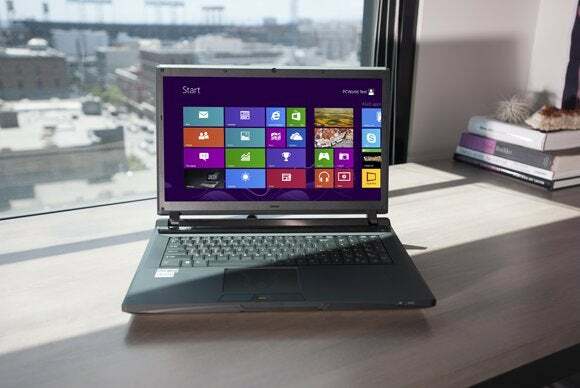 It chalked up a blazing 116 on PCWorld’s Laptop WorldBench 9, and it made short work of encoding high-definition videos. The 750GB mechanical drive that supplements its high-speed solid-state drive (SSD) provided more than enough storage for work and entertainment files. An abstract logo is projected through the Krypton's trackpad. Too bad the Krypton isn’t as well suited to the road. I’ve long wanted a gaming portable I can tool around with, satisfying my addiction even when work drags me off to a faraway city. But the two-inch-thick Krypton and its power brick will put a beastly 11 pounds on your back (shoulder, if you rock a messenger bag). For all that weight, you’d think this laptop would have a stronger lid. It’s actually rather flimsy. Dump an open Krypton on the floor, and it will likely be lights-out for the display. I had the same complaint about Origin’s machine, of course (since they share the same source platform). 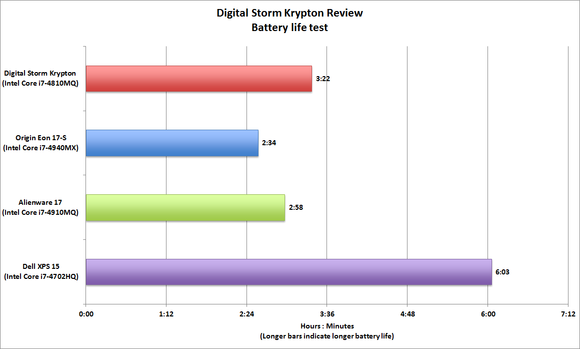 While you won’t be able to travel without the power brick, the Krypton’s “lesser” CPU did help its battery outlast both the Origin and the Alienware machines by a healthy margin. The trackpad can be clingy, sometimes catching files and icons I didn’t want to move. I also had to occasionally hunt down AWOL cursors due to the trackpad’s merely fair palm rejection. But I like the near-full-sized backlit keyboard. It’s comfortable to type on. The keys provide good tactile feedback and are nicely separated from each other to minimize typos. The Krypton’s screen and speakers do as much justice to the gameplay as those on any reasonably priced gaming portable I’ve seen. You won’t confuse this 17.3-inch TN display with a vivid IPS model—its colors look a little washed-out—but it’s unusually sharp when viewed straight-on (and you wouldn’t game any other way). 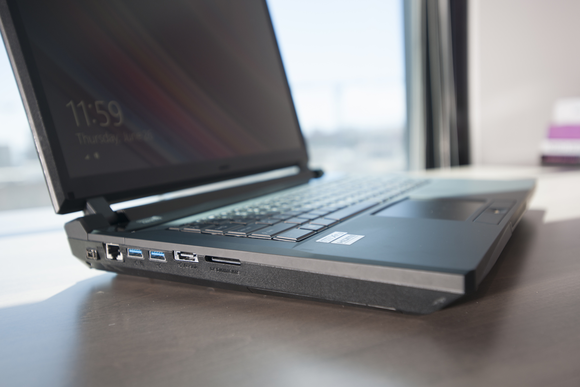 Onboard audio is a quantum leap better and richer than on non-gaming laptops. 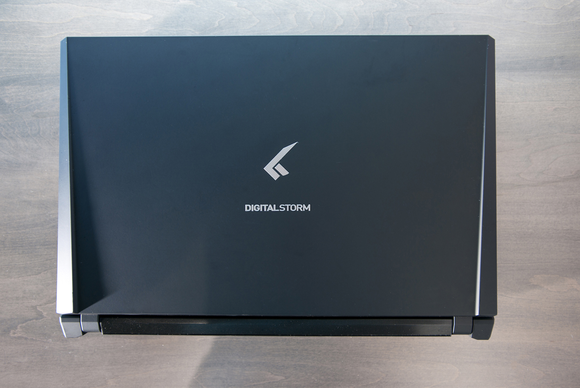 Digital Storm includes Onkyo speakers in the raised speaker bar that stretches most of the width of the laptop below the screen. That, plus the pair of midrange drivers, the one-inch subwoofer mounted on the bottom of the laptop, and the SoundBlaster X-Fi MB3 software, combine to deliver rich, engrossing audio. The Alienware and Origin laptops have faster CPUs, which resulted in better performance on our video-encoding benchmark. The Krypton delivers just about every connector and slot you’d want in a laptop that might serve double-duty as a mobile workstation. Video ports are on its rear panel: HDMI, DisplayPort, and mini DP (but no VGA). On the sides you’ll find two USB 3.0 ports, one USB 2.0 port, and one USB 2.0/e-SATA combo port. There’s a multi-format memory-card slot; and 1/8-inch jacks for headphone, mic, speakers, plus S/PDIF for connecting to an outboard DAC (digital-to-audio converter) or a surround-sound setup. That’s all great, but the FireWire port could go the way of the Dodo for all we care. The digital audio and video world is moving to Thunderbolt (an I/O port this machine lacks). Network connectivity is top-notch, with gigabit ethernet, Bluetooth 4.0, and a 2x2 802.11ac Wi-Fi adapter. Finally, you get an onboard fingerprint scanner tucked between the trackpad keys, and a Blu-Ray player/DVD burner on the right side. As with Origin’s machine—remember, they share the same infrastructure—you’ll find removable panels on the bottom of the Krypton that provide quick access to the battery, hard drive and SSD, optical drive, and memory. As is usually the case with boutique vendors, you can’t lay your hands on a Krypton before you buy one. And Digital Storm’s return policies are stiffer than some: The company charges a 15-percent restocking fee, and you must pony up for the shipping. Further on the downside, Digital Storm’s tech support is somewhat thin. Agents work only Monday through Friday, from 8am to 5pm Pacific time. That means you won’t be able to get live help during the times you’ll most likely be playing games and encounter a problem—namely, evenings and weekends. Carrying the Krypton will definitely give your body a workout. The laptop and its power supply weigh a combined 11 pounds. I discovered that even during support hours, you must leave a voicemail and wait for a callback—which can take a while. A company rep admitted that often they get enough calls on Monday that they don’t return some calls until Tuesday. And some of reps would benefit from more training. I stumped the first employee I called in with a simple question: How do I set the resolution to 2560x1600? To his credit, he escalated the problem to a senior rep who called me back and solved the issue quickly. Digital Storm is among a growing list of vendors that offer remote-control support. A rep can (with your permission, of course) sign into your machine and troubleshoot directly, instead of tediously relaying instructions over the phone. It makes an always-stressful process much faster and easier. Digital Storm strikes one of the best price-to-performance balances I’ve seen among high-end gaming laptops. It got stomped by the sexier 2014 Alienware, but that machine costs $700 more and doesn’t deliver higher performance across the board. Still, Digital Storm needs to slim it down and toughen it up for the road. Better tech support wouldn't hurt, either. Digital Storm’s 17-inch gaming portable is big, heavy, and no-frills; but it’ll rock your virtual worlds at a great price. Bryan has been writing about technology since the days of $6,000 desktop PCs and 4-function calculators the size of 8-track tapes. It's been a long strange trip in the land of Moore's law.